The Calistoga Queen Bedroom Group by Magnussen Home at Prime Brothers Furniture in the Bay City, Saginaw, Midland, Michigan area. Product availability may vary. Contact us for the most current availability on this product. 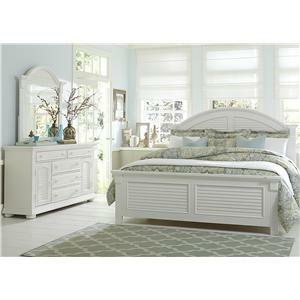 This collection creates a rustic chic environment featuring the best bedroom necessities. 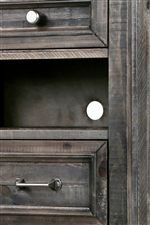 Pine construction features a weathered charcoal finish and is beautifully accented by brushed pewter drawer pulls and knobs. 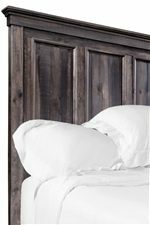 The grand panel bed showcases a rustic, inviting appearance. Casegoods featured felt-lined top drawers and French and English dovetail joinery for easy and durable usage. Enjoy easy wire management and touch lighting, available on select pieces. Side mount ball bearing metal guides also make drawers easy to use, while a dust proofing seal keeps your items clean and safe. This collection features clean lines with subtle accents and moldings, such as pointed block feet that provide a perfect complement to the collection's linear design. 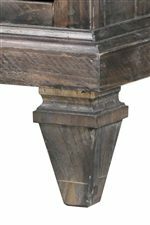 The Calistoga collection is a great option if you are looking for Transitional Traditional furniture in the Bay City, Saginaw, Midland, Michigan area. Browse other items in the Calistoga collection from Prime Brothers Furniture in the Bay City, Saginaw, Midland, Michigan area.